Tanya is a nationally recognized leader in public relations who was named California’s 2018 Communicator of the Year by CAPIO (California Association of Public Information Officials). She holds the Accreditation in Public Relations credential. 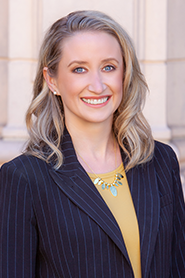 Serving as chief spokesperson for the Port of San Diego for six years, Tanya managed the Port’s strategic communications program, including the website, branded social media accounts, speakers bureau and news releases, as well as responding to nearly 800 media inquiries per year. During Tanya’s tenure, the Port ranked No. 1 among maritime ports worldwide in Facebook and Twitter followers, and its social media policy was recognized as a national model for governments. An experienced crisis communications manager, Tanya participated in regional drills focused on marine and aviation security, terrorism, medical epidemics and environmental disasters. She is a graduate of the Citizens Water Academy of the San Diego County Water Authority. ​Tanya’s community outreach campaigns and strategic communications programs received awards in 2017 and 2018 from the American Association of Port Authorities, the Association of Marketing and Communication Professionals, the California Association of Public Information Officials and the Public Relations Society of America San Diego-Imperial Counties. Before embarking on her public relations career, Tanya built a name in the media industry. A graduate of the University of Massachusetts Amherst, she reported for newspapers including The San Diego Union-Tribune, The Boston Globe and the Virgin Islands Daily News; along with on-camera work for affiliated broadcast news stations. She attended the Ted Scripps Leadership Institute of the Society of Professional Journalists. At MNM, Tanya is Vice President of Public Relations. She is a Democrat who lives in the South Bay, where she and her husband are raising their two young children. She is passionate about building public trust in the governmental, business and nonprofit institutions that touch our lives.